In the kabbalistic school of Safed the mystical aspect of prayer, as “the vehicle of the soul’s mystical ascent to God” (see cat. no. 30), is of great importance. To this end special daily prayer books were composed; these contain not only the statutory prayers, but also prayers with mystical content. The authorship of these prayer books is generally attributed to Isaac ben Solomon Luria (1534–1572). 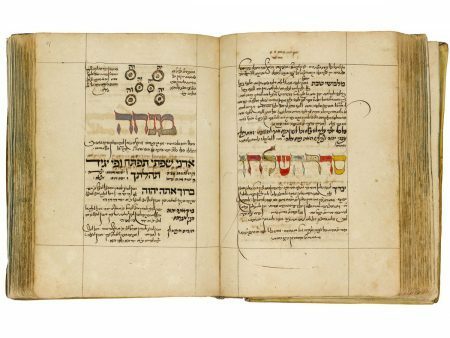 The “Lurianic” prayer book is known as Siddur ha-Ari, the daily prayer book of the Ari. Ari literally means “lion,” but is also the acronym of Luria’s nickname: Ha-Elohi R. Yitzhak (The Divine Rabbi Isaac). In the Braginsky prayer book, kabbalistic commentaries and kavvanot (mystical intentions) were included (see cat. no. 30). Luria’s prayer book went through redactions by Meir ben Judah Leib Poppers (ca. 1624–1662) and Hayyim ben Abraham Ha-Kohen (ca. 1585–1655). Shlomo Zucker, in a description kept with the manuscript, established that the text of the Braginsky manuscript underwent yet another redaction by a student of Hayyim Ha-Kohen, Nathan Nata Hannover (d. 1683), or by one of Nathan’s followers. Hannover lived and worked in Broda from circa 1673 until his violent death there at the hands of anti-Habsburg rebels, on 14 July 1683. It is likely that the manuscript was copied during Hannover’s stay in Broda. The manuscript begins with an unfinished title page that contains a decorative floral border in red, yellow, and green, but without any text. It is signed “Samuel ha-Kohen, cantor in Broda,” who is either the copyist or perhaps the person for whom the book was written. Throughout the manuscript the scribe included initial words with letters in alternating colors, occasionally using silver paint. Fuks 1979, p. 46; Scholem 1961, pp. 273–278; Seeligmann 1904, p. 220, no. 3623.